The Disney World for Adults, Las Vegas is about to become the star of Carnival in the United States?! ... but wait, this is the same weekend as Miami Carnival and costumes prices are $1200. Hmm. Las Vegas Carnival 2010 has chosen 10 countries to participate in the first ever international carnival competition on October 10, 2010. 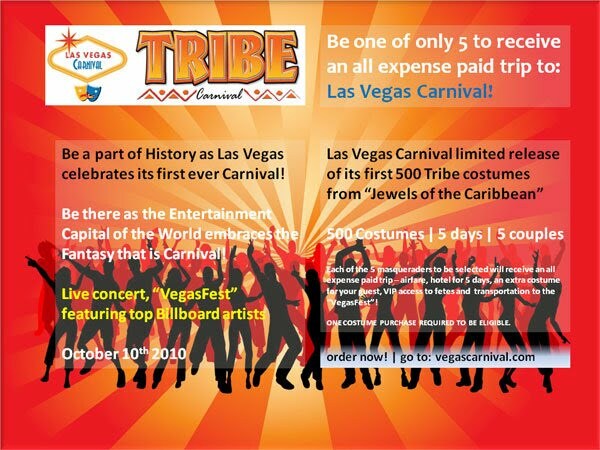 The selection process is still underway but the first two bands are Trinidadian bands, TRIBE and SPICE.